Finally making its way into American theatres on the cusp of its director’s passing, Mistérios de Lisboa [Mysteries of Lisbon] gives us an epic look into the bourgeois dramatics of Portugal’s capital city. The press notes for the film contain a pretty accurate and concise three-word description by Raúl Ruiz—“birth, betrayal, redemption”. That triplet sums up Camilo Castelo Branco’s 1854 novel and the adapted screenplay from Carlos Saboga to perfection, each word a huge piece to the tale surrounding an anonymous orphan named João. But as his mystery is uncovered, the sprawling soap opera turns into a sumptuous visual splendor of the past and fate’s often surprisingly coincidental blueprint. Through the orations of dying men and men raised from the ashes of dead aliases, Lisbon is brought to life through its 19th century aristocratic nobility. With a young boy in search of an identity at its center, his part of the puzzle only scratches the surface. To place the characters’ stories on hold for a second, the most magnificent part of Ruiz’s final work is its stunning visuals. So much of the action is shown in the background of long shots, the full scope of their intricately art directed environments on display as much as the people populating them. 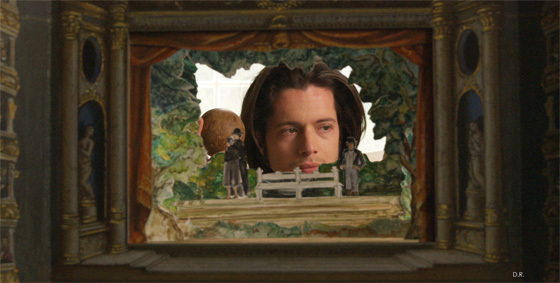 Cinematographer André Szankowski deftly uses depth and a litany of single-shot long takes superbly choreographed in order to give the film a poetic flourish. The camera delicately hovers and pivots in slow sweeping arcs as it follows characters around the set rather than the frame. Detaching and realigning with multiple actors inside one take, the narrative weaves through events as though we are flies on the wall privy to the secretive gossip shared. Hearsay and secondhand memories whisk us away to experience their unfolding rather then merely listening to the details. Jostled and thrown back and forth between up to three distinct points in time for over four hours, it occasionally proves difficult to keep up. Everyone seems to be a Count or a Countess, related, or a direct cause to someone’s very existence, and yet no one has officially met until now. An important period of introspection for young João (João Arrais), his lack of a name weighs heavily on his psyche. Happy to retreat into books while excelling in class with Father Dinis (Adriano Luz)—a man others begin to wonder may be his biological father—it is only when a bully disrespects the parent he has never met that his Portugese sense of honor takes shape. A trait used prevalently throughout the myriad of plot threads, honor and respect will prove to be both the making and destruction of many players. For this nameless youth, however, his intrinsic sense of pride becomes the catalyst for all that follows. His mother is introduced, the name Pedro da Silva is discovered, and the rest of his story is heard. We’re sent back into the forbidden romance of second-born nobility—the senior Pedro de Silva (João Baptista) and Ângela de Lima (Maria João Bastos)—the con game of a newborn baby’s life bought by a gypsy named Sabino Cabra from the mercenary assassin Knife-Eater, and the tragic marriage to the Count de Santa Bárbara (Albano Jerínimo) that forced the separation of mother and son. Soon shown as the surrogate guardian angel of Lisbon itself, it is Father Dinis who exposes the truth to Pedro’s origins, reciting the words of the boy’s long dead father and the Count during the final moments of both lives. These mysteries uncover answers to Pedro’s birthright while positing others in regards to Dinis himself—an enigma at the center of impactful decisions within each of the film’s multiple narratives. It all combines for a brilliant first act: the layering of past and present impeccable as the unraveling stories enchant. That’s not to say the second act isn’t worthwhile, the memories and secrets it unearths are simply not as impressive when compared with Pedro’s. After the intermission we learn about Father Dinis’ life and his similar orphaned anonymity. By listening to an old monk (Carloto Cotta) and the priest himself, we discover he has lived an almost impossible existence of adventure, romance, and deception—all with a never-ceasing fraternity to God and the sanctity of life. His origins add more gossipy morsels of betrayal, but never equal the complexities of Pedro’s past. The tale of the woman he loved, as told to her daughter Elisa de Montfort (Clotilde Hesme), proves to be the most interesting, but the purpose of dissuading her from a path of vengeance like the one that ruined her father only causes her to descend deeper as a result. Everything will come full circle, though, as Albert de Magalhães (Ricardo Pereira) enters the fray—a mysterious foreigner with the unlikeliest links to both the orphan’s and Dinis’ evolving lives. No matter where the story goes or who is introduced as one thing before proving himself to be another, Mysteries of Lisbon never takes its name lightly. Utilizing its camera tricks to keep us at a voyeuristic distance from the action, we become enraptured by the melodrama as we anticipate more outlandish activities. The shrouding of the frame fails at times—a constantly moving blackened curtain vignette masking Álvaro and his Countess at bed—but its ability to manifest feelings of disorientation—Pedro’s recovery from a concussion—and awesome displays of extended takes through intricate camera maneuverings—the Count and Countess of Santa Bárbara meeting at a dance, the birth of Alvaro’s son and the anguish his life brings, and a botched duel between Alberto and a slanderer outside of Father Dinis’ coach to name a few—never ceases to amaze. With reflections and superimpositions metaphorically driving the film, its gorgeous compositions like a shot of Jerónimo’s Count dying sideways from overhead show artistry isn’t only at the whim of story. We watch Pedro grow into a young man, (played by José Afonso Pimentel), but the story soon proves to not have been about him in the usual sense. He is our entry point and his relationship with Father Dinis uncovers secrets, but in the end the film is about Lisbon at a time of wealth and splendor. We watch the nobility rule over the poor through customs of status; we see the prejudices of the rich and the lengths some must go to find a love greater than their social stature allows. Villains become heroes and heroes villains, but every action has a direct result on the future of those they’ve touched. Maids eavesdrop in the corners of the frame as the bourgeois wax on about their indiscretions and impatience, the dichotomy of life shown along with the selfish desire to manipulate. It’s melodrama on the stage of real life—a little boy’s theatrical musings of his own unbelievable tale through his toy proscenium. And while Mysteries of Lisbon wasn’t intended to be Raúl Ruiz’s swan song, he couldn’t have left us with a better example of cinema’s power of story. 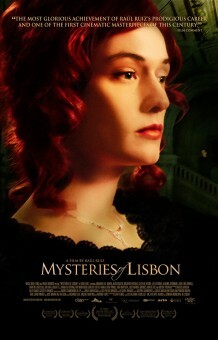 Mysteries of Lisbon is now in limited release.